Some people have a dream of one day running (and finishing) a marathon. Learning a new language. Speaking publicly. Taking an acting class. Singing a solo. Doing something OUTSIDE THEIR COMFORT ZONE. Challenging themselves. Doing something they know will cost time, effort and a lot of energy. Why do we seek to challenge ourselves? Isn’t it just very comfortable to be in a reliable, predictable life where you know exactly what is going to happen every single day? Many people will say yes to this, and many others will say no. There is no right answer to this question. But although I can truly enjoy a life that isn’t necessarily filled with adventure every single day, I guess I belong more in the other category. After all, I wouldn’t have quit my job, packed my suitcase and bought a one-way ticket to Spain, and gotten on that plane all alone, off to start a new life in a country I had never before visited, with a language I did not speak - if I didn’t like some adventure. I am not much of a competitive person. I don’t have the need to win over others, be “better” or “superior“ in any way. But I love to compete against myself! I love to show myself that “I can do it!”, and that I am the one who decide where the limit is. The feeling it gives me is indescribable. We all have different concepts of “what is a challenge for me”, same goes for dreams and goals. 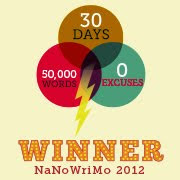 For me this November, my great challenge will be to write 50 000 words of a novel in 30 days. I am taking part in National Novel Writing Month (NaNoWriMo) and I have been so ready these last few days I have hardly been able to contain myself and not start writing already. I did itlast year too. Wasn’t planned at all, and I didn’t start brainstorming until day 3, which was a bit stressful in theory cause it left me behind already before starting. But I did it, I reached the magical 50 000 word count on November 30 and enjoyed the whole experience so much. The feeling of accomplishing such a challenge was GREAT! I hope to have that same feeling in a month time! Are you taking part as well? It would be great to hear from you! 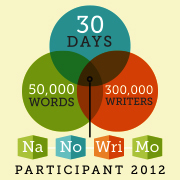 In case you want to know more about what NaNoWriMo is about, have a look here. Det var så godt å høre at det gikk fint med Sandy, tenkte på deg! the `Norwegian Senorita`. Jeg er en lege med spesialistoppgave i Norge, men egentlig interessert til å flytte til Spania. Jeg snakker bra spansk og lærer det i fritiden. Hvordan har Du klart deg der ?, har du lyst å fortelle mer ?, lyst å gi noen tips? etc. Hilsen fra Norge til deg, A.B. Skal svare deg på mail A.B! WOW!! That is so awesome! I can write 50,000 words in a journal maybe, but not so much in the form of a novel! What did you do with your work from last year? That sounds awesome! I can't wait to read more about that! You rock! Haha, thank you Katrin! I can't wait to get started! I couldn't really agree more. Some people wouldn't even bother to challenge themselves. But I believe those people who challenge themselves,take risks, are the ones that make difference. 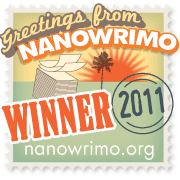 I hope you win NaNoWriMo 2012. I know many say that life starts on the outside of your comfort zone. They might be right! I hope I will win too! I mean, I WILL win :) Thanks again for stopping by, so very nice as always! Grrrrr!!! Melde meg på? Ikke melde meg på? Melder meg på selv om jeg ihvertfall må bruke de fem første dagene på redigeriiing!! Gjør det, gjør det, gjør deeeet! :) Jeg kom godt i gang i går, og er klar for neste økt nå! Gøy! I didn't catch this post until now. This is really great!! Will you write it in English, Spanish or Norwegian? haha. You are very right about being an adventure seeker. I wouldn't really call you a creature of habit or comfort. For this you should be proud. Thank you for the support Ashley!! I write & express myself best in Norwegian. And about that other thing- right back at ya girl!